As a photographer, I've learned that it's kind of important to take note of hidden messages that slip into pictures without intention. 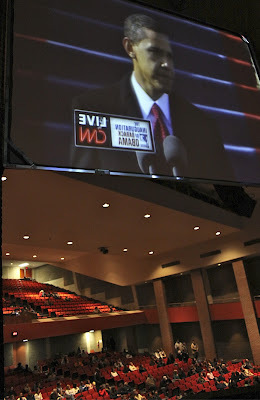 For instance, yesterday we shot pictures of Lee students in the Conn Center watching the inauguration of President Barack Obama. 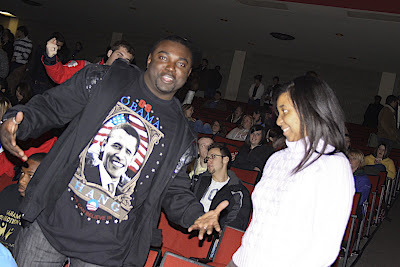 Unfortunately, the Obama shirt on the young man above was wrinkled and obscured in such a way to read "HANG" instead of "CHANGE." And in another intriguing example, shots of the giant screens displaying the coverage of CNN read backwards from behind. The simple swap of perspective morphs the word "LIVE" into the semblance of "EVIL." In summary, photos should be reviewed closely before they're used, no matter what the theme, time, or place. 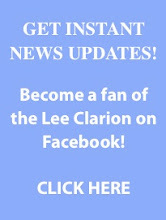 • See more pictures from Obama's inauguration at Lee here.